German civilian surveillance radar satellite. Scientific / commercial surveillance satellite, equipped with an X-band synthetic aperture radar with 1 meter resolution SAR satellite built by EADS Astrium for DLR, InfoTerra, Germany. Launched 2007 - 2010. Used AstroBus. AKA: Tandem. Status: Operational 2007. First Launch: 2007-06-15. Last Launch: 2010-06-21. Number: 2 . Payload: 394 kg (868 lb). Gross mass: 1,346 kg (2,967 lb). Height: 5.00 m (16.40 ft). Diameter: 2.30 m (7.50 ft). 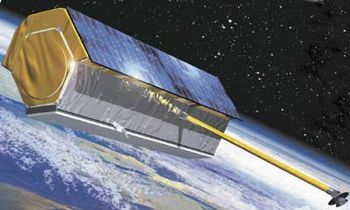 TerraSAR-X was built per a March 2002 partnership whereby the Federal Republic of Germany, represented by the German Aerospace Center (DLR), and EADS Astrium GmbH agreed to jointly bear the costs of constructing and implementing this X-band radar satellite. 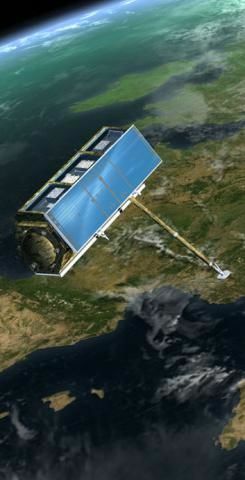 EADS was responsible for the exclusive commercial exploitation of the satellite, while DLR coordinated the scientific use of the data. Total value of the program was approximately ? 130 million, of which DLR funded ? 102 million. Development Cost $: 190.000 million. Cost Notes: Euro 130 million.. Electric System: 0.61 average kW. Family: Civilian radarsat, Surveillance. Country: Germany. Launch Vehicles: R-36M 15A14, Dnepr. Launch Sites: Baikonur, Baikonur LC109. Agency: DLR, EADS Astrium. Bibliography: 2, 6978, 13270.